Royal Leamington Spa was built on the Victorian belief in the medical properties of mineral spring water. Reflecting this heritage, the Town still retains a significant number of Practitioners of complementary and holistic health treatments. In the twentieth century it became a manufacturing centre in support of the car industry. In recent years it has been proven to be a profitable town in which to do business. It still has a sizeable manufacturing centre, but it has a wide range of creative industries as well and it is now a centre of a computer games industry which makes a major contribution to the local life and economy. 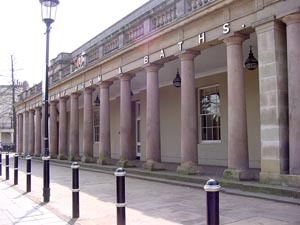 A new cultural and tourism complex has been created in Leamington Spa's historic Royal Pump Rooms. This building was the home of the Town's last saline Spa and treatment continued on the site until the early 1990's. A saliine spring still stands outside the Pump Rooms as a reminder of its former purpose. The total cost of refurbishing the building was £7 million. The project, initiated by Warwick District Council, began in 1997 and was completed and opened to the public in the summer of 1999. The Town's Art Gallery and Museum, Library and Tourist Information Centre have now moved here and are situated alongside the historic Assembly Room and a new Café.